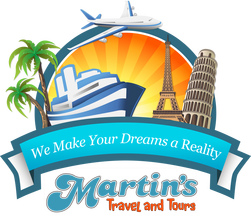 Thank you for reaching out to Martin’s Travel and Tours. We have some exciting news to share – while our office in LA is closed, we will continue to “Make your Dreams a Reality”, now as part of Dimensions in Travel. All of your favorite travel advisors are ready and waiting to assist you, Debbi, Monica, Jan, Richard and Beverly. Click here to see our new website or call 800-828-2962 and ask for your favorite travel advisor!